Sarah Nader- snader@shawmedia.com Dundee-Crown's Juwan Stewart (center) shoots a basket during the third quarter of Monday's Crystal Lake Central Regional against Crystal Lake South on March 3, 2014. 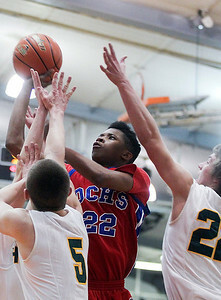 Dundee-Crown defeated Crystal Lake South, 61-52. Sarah Nader- snader@shawmedia.com Crystal Lake South's Wes Buckner (left) guards Dundee-Crown's Nick Munson while he shoots a basket during the second quarter of Monday's Crystal Lake Central Regional March 3, 2014. 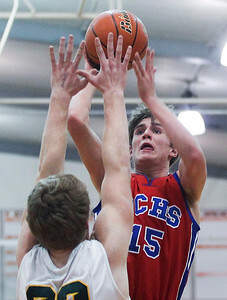 Dundee-Crown defeated Crystal Lake South, 61-52. Sarah Nader- snader@shawmedia.com Crystal Lake South's Wes Bucker (left) shoots over Dundee-Crown's Conner Steinmetz during the third quarter of Monday's Crystal Lake Central Regional March 3, 2014. 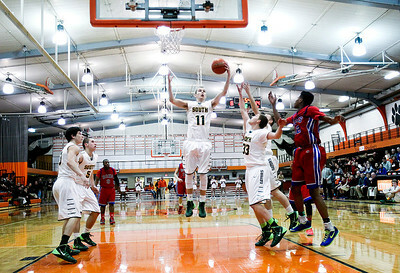 Dundee-Crown defeated Crystal Lake South, 61-52. Sarah Nader- snader@shawmedia.com Dundee-Crown's Cordero Parson (left) guards Crystal Lake South's Caleb Johnson while he shoots a basket during the fourth quarter of Monday's Crystal Lake Central Regional March 3, 2014. 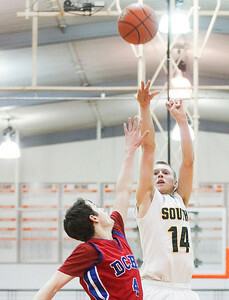 Dundee-Crown defeated Crystal Lake South, 61-52. Sarah Nader- snader@shawmedia.com Crystal Lake South's Chris Mahoney (center) catches the rebound during the second quarter of Monday's Crystal Lake Central Regional March 3, 2014. 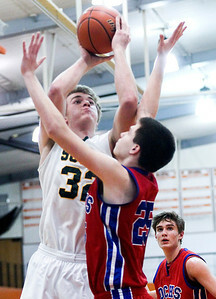 Dundee-Crown defeated Crystal Lake South, 61-52. Sarah Nader- snader@shawmedia.com Dundee-Crown's Malik Dunner (left) blocks a shot by Crystal Lake South's Chris Mahoney during the third quarter of Monday's Crystal Lake Central Regional March 3, 2014. Dundee-Crown defeated Crystal Lake South, 61-52. Dundee-Crown's Malik Dunner (left) blocks a shot by Crystal Lake South's Chris Mahoney during the third quarter of Monday's Crystal Lake Central Regional March 3, 2014. 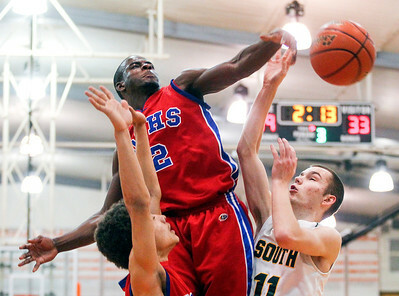 Dundee-Crown defeated Crystal Lake South, 61-52.